Its that time again! Here is my monthly contribution to The Spirit World blog over at The Well Fed Network. Without a doubt, January is a time of fighting the winter doldrums. Many across the northern tier states are having a wicked trying winter with unusual amounts of snow while we have been oddly warm but very dark and dreary with non-stop fog here in New England. For many of us, thinking of tropical climes can be a treacherous thing unless you have the means to jet off to the Caribbean, South America, Tahiti, New Zealand, Australia or other reasonable locations.Without such options, I am left with a trip to my local Latino market to get a taste of my childhood. I remember visiting relatives in Colombia for Christmas and experiencing equatorial weather and foods. One refreshing sort of drink comes to mind: the fruit shakes made from tropical fruits (frescos de frutas) like guava, mangos, guanabana, and berries such as blackberries.In the parks of Pereira and on the coast of Colombia (cities like Cartagena, Santa Marta, Tolu, and Barranquilla), street vendors can be found whipping these drinks up to order. Back in the 60s, they would serve the shakes up in glasses that you would use and then give back to the vendor who would then rinse it out for the next patron. Its likely this has changed since then! Nearby, food vendors can be found selling things like empanadas, yucas fritas, chontaduros (roasted and salted acacia tree fruit, sort of tastes like chestnuts), candied fruits, and simply divine roasted ears of corn (mazorca asada).These frescos de frutas are not only rejuvenating, they are also loaded with Vitamin C and other antioxidants. You can make it like they do in Colombia (see below) or you can get creative and add your favorite smoothie amendments. 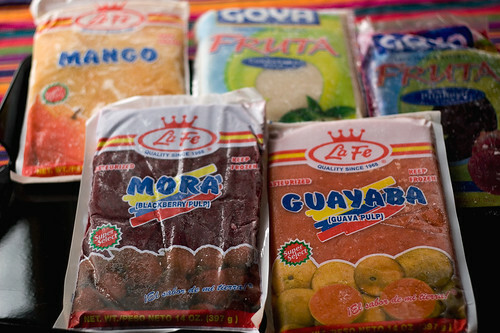 You can buy most of these as fruit pulps (stored in frozen packs) like you see below in your Latino grocery store. 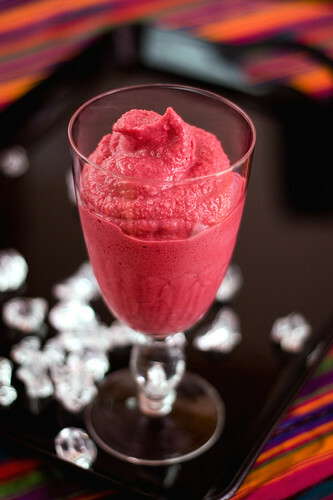 Put fruit pulp, sugar, milk, and ice in blender and blend until well mixed. You may need to add a bit more milk to get the consistency you desire. You also might need to stop and open the blender a couple of times to force the unblended chunks down into the base for proper blending. (Mora (Blackberry) Shake up close © 2007 Nika Boyce)I hope you take the time to hunt down some of these fruit pulps and give a try at making your own frescos. You cant go wrong! ← Menu For Hope III winners announced! Yum. Looking at these gorgeous photos I can dream I’m in a warm, tropical place!